It's a Hell of an Adventure! Battle all the horrors of Hell in this fantastic series of seven adventurers for Necropolis 2350! 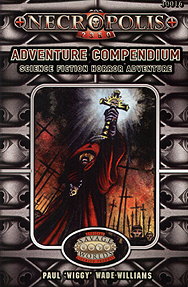 The Necropolis 2350 Adventure Copmpendium contains a set of adventures for the sci-fi horror Roleplaying Game, Necropolis 2350 and is based in a fictional 24th century. In these dark days, mankind, divided into two main camps and stands on the brink of extinction. The Third Reformation Church are locked in desperate battle against "undead" invaders known as the Rephaim. While the heroes of humanity use advanced weapons and can call upon the power of faith the twisted Rephaim are masters of necromancy and wield vile technology created from living tissue. Each adventure contains all the information the GM needs including maps, handouts and full monster stats.